Version 2.x is a total recode based on the Ace2 framework which became necessary in order to support some of the longtime wanted and suggested features. It's now possible to show different groups of bars which can be configured in many ways. Each group can be assigned an individual look and filter settings. EBB can be configured via a dropdown menu which is accessible via chat (/ebb config), FuBar plugin or (for the group settings) by right clicking the groups anchor. After setting up a group, its anchor can be hidden by alt-left clicking a bar or the anchor itself in order to lock the group in place. how can we get buffs to grow sideways? Is there a way to use a different color for "timeless" auras? 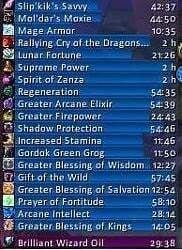 I liked it very much in CT Buff Mod the auras with no time, like mount auras, presences, guild champion, etc simply showed in green color, so we were able to separate the temp buffs from auras very easily. I found only "Full bars for timeless" option, but is there any simple option to customize the bar colors? But that's exactly how you lose your setting for this addon! It's in configuration mode -- 'blessing of demonstration' should be self-explanatory. will remove the fan update if you like now that the official one is out. Last edited by Ravenslair : 08-30-12 at 06:40 AM. Will upload it here, too, once I know it's stable. It has only glaring error: a reference to the now-non-existant ranged slot. Early in the beta, I edited the offending array element and so far mine's worked fine, though I can't say I've beat it with hammers. Elkano's been teasing but not delivering so I'll point you to this ( http://www.wowinterface.com/download...lkBuffBars.htm ) in the interim, which makes the edit I mentioned. Last edited by VincentSDSH : 08-29-12 at 01:46 PM. I can't live without this addon. Please don't let me die! Fantastic!! Glad you're still with us! And thanks again for working on the addon! Got an ETA on an Alpha or Beta version? Couldn't imagine playing without it. Totally agree. EBB is one of the best buff/debuff tracking addons. Last edited by Deadlyz : 07-04-12 at 03:51 PM. 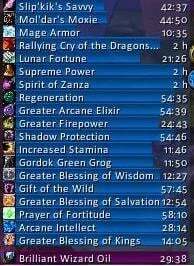 Really hoping this amazing addon is updated for Mists. Couldn't imagine playing without it.